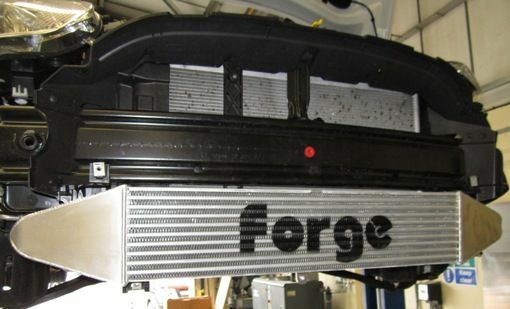 Upgrade the cooling performance of your Fiesta ST with this up-sized Front Mount Intercooler from Forge Motorsport. By reducing intake air charge temperatures, this intercooler delivers gains of +5whp on a stock ecu Fiesta ST and +13whp and +27wtq when tuned for the bigger FMIC. The Forge Motorsport Front Mount Intercooler for Ford Fiesta ST 1.6 EcoBoost Engines decreases engine temperature for better performance. This upgraded intercooler kit for the Mk7.5 Ford Fiesta ST is a direct replacement for the Original intercooler and installs with no cutting of any body or trim. The installation utilizes the original boost hoses and air ducting, but by using all the available space and increasing the Intercooler core from 50mm thick to 70mm replacement, significant gains were made. The main reason for increasing the size of an intercooler is to reduce the incoming air charge temperature, as this is directly related to engine power. Cooler air is denser, and thereby has greater oxygen content, resulting in a better burn in the combustion chamber, ultimately resulting in an increase in power. For a given turbo charged engine where the characteristic or specification remain unchanged other than varying the inlet temperature, there is a proven formula to calculate the relationship between the power produced and inlet temperature. In reality power loss through temperature may be greater. Many engine management systems will reduce power due to temperature increases, in order to protect engine components .